Christmas is coming and for many of us decorating for the holidays will begin soon, if it hasn't already. I am planning to start my decorating right after Thanksgiving and I wanted to get a jump start by creating a Noel Christmas Banner to hang on our media cabinet for our family Christmas dinner. I think it would also look great hanging on a mantel or even on the wall. The banner I created was easy to put together with some fabulous Leaky Shed Studio chipboard, ribbon, patterned paper and glitter glue. Begin with 6 of the Pennant Banners as your base. Cover each banner piece with Christmas themed patterned paper. String the banner pieces to together by tying each piece to the next piece using a 16" length of red ribbon. Once the ribbon is threaded through the neighboring banner pieces, tie the ribbon in a bow. Spell the word "Noel" using the Large Type 4" Alphabet and cover each letter with gold glitter. Create the white outline by adhering each chipboard letter to white cardstock and trim around it with scissors. Attach letters to banner base. Embellish with paper holly leaves and jewels. Some options for creating the holly leaves would be to cut them by hand, use a metal die or use an electronic cutting machine. I cut mine using a digital cutting file that I created and cut with my Silhouette Cameo. If you are interested in this cutting file, it will be available to download for FREE on my blog tomorrow along with a more detailed supply list. I hope this inspired you to make some of your own Christmas decorations using Leaky Shed Studio Chipboard. 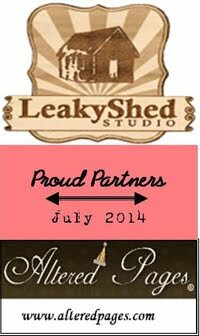 We can't wait to see what you create and share with us oh the Leaky Shed Facebook page. Wow wow wow!! This is gorgeous!! I loveeeeeeeeee the glittered alphas!!!!! Thanks so much Julie! I love the glitter too! Gorgeous banner Juliana!! Its so pretty and festive! I agree, they are so much fun to make! Such a fun banner!!!! I love it! This turned out gorgeous!!! Hooray for glitter.